ChicagoCHEC continues to impact Chicago Communities, Research and Trainees in meaningful ways. Since inception in 2015, ChicagoCHEC has been a key player in advancing cancer health equity at the local and national level. ChicagoCHEC works with over 20 Community Partners in and around Chicago, has directly engaged 28 undergraduate and post-baccalaureate students to become involved in cancer research via the 2016 & 2017 ChicagoCHEC Research Fellows Program and continues to work with many trainees as a part of the ChicagoCHEC Incubator & Catalyst Grant Program and other programming. 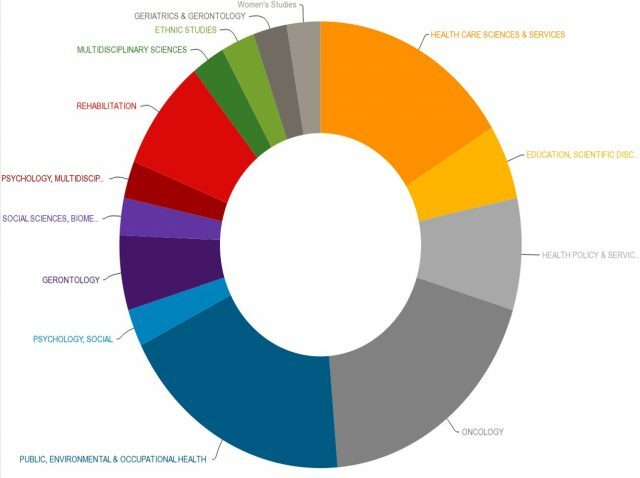 To date, ChicagoCHEC consists of approximately 90 direct members who are involved in either research, training or community outreach and development. Expansion of the ChicagoCHEC Research Portfolio and Training Recently, our work has expanded to include the LGBTQ community and an exciting opportunity to understand lung cancer disparities in Cuba. In the Spring of 2017, we expanded our research program to include two more research projects – one focused on Breast Cancer Disparities and one focused on Engaging Citizen Scientists as a means to improve Prostate Cancer Screening. Below is a snapshot of our current research areas! Research Areas, Web of Science, InCites, March 2017. Our 2017 Community Forum, Community County: It Takes a Village to Defeat Cancer was our largest community event to date! The event came to a close with Keynote Speaker, Colon Cancer Survivor, and Blue Hat Foundation Founder, Candace Henley’s powerful words on screening, health access, and having a network for support! CECIL the Inflatable Colon takes on Chicago! Our walk through, educational colon teaches individuals about colorectal cancer, screening, and the biology of disease! To date, ChicagoCHEC CHE’s have taken over 100 community members on an educational tour of CECIL, increasing knowledge, awareness, and empowerment! In our annual community reports, we highlight a few of our key accomplishments across the three core areas of ChicagoCHEC: community engagement, high-quality research, and education and training. These reports were presented to the public in-person at our annual Community Forum, and are available online. View the 2016 Community Report. View the 2017 Community Report. Choose to Change (Community Partner: Alliance of Chicago & the IL Tobacco Quitline) – The Choose to Change Team has been pivotal in the integration of an important referral component into the Electronic Health Records for low-income smokers. They are 1 of 11 state teams to achieve such a build and the ONLY to have done this within Federally Qualified Health Centers! MiGuia (Community Partner: ALAS-WINGS) – The MiGuia Team has developed one of the first tailored smartphone applications for Hispanic Breast Cancer Survivors in an effort to reduce cancer-related symptom burden and improve quality of life! WeCanConnect (Community Partner: Access Living) – The WeCanConnect team has developed and launched ScreenABLE Saturdays, a health fair event specifically for women with disabilities. Due to ScreenABLE Saturdays, women with disabilities are getting FREE ACCESSIBLE mammograms – many for the first time in their lives! Prostate Cancer Disparities on the South Side (Community Partner: Project Brotherhood) – The Prostate Cancer team has proved cross-site collaboration and training are imperative as the team better understands how prostate cancer cells affect organoid cultures in African American patients, making significant progress in optimization techniques! Reducing Colorectal Cancer Disparities (Community Partner: ACCESS Community Health Network) – The Colorectal Team is making important community linkages that will aid in understanding colorectal cancer screening, incidence and prevalence among African American men on the South and West side of Chicago! Obesity Intervention in Latinos (Community Partner: Puerto Rican Cultural Center) – The Obesity Intervention Team has made a indelible mark on Chicago’s Hispanic neighborhoods, providing continuous community outreach, programming and support for Hispanic men! Engaging Citizen Scientists (Community Partner: Project Brotherhood) – More to come soon – this team is just getting started on exciting research efforts. Molecular Approaches to Breast Cancer Disparities (Community Partner: Mercy Hospital & Medical Center) – More to come soon – this team is just getting started on exciting research efforts. 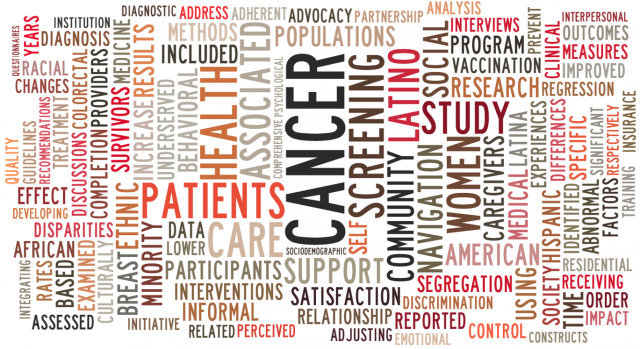 ChicagoCHEC has supported the publication of over 50 manuscripts, the creation of nearly 10 non-traditional research products (infographics, brochures) and have disseminated research efforts through contemporary means such as Skinny Trees, a podcast focused on Health Inequities and Cafe, Salud y Vida, a Spanish Public Radio Show that discusses various health topics, hosted by ChicagoCHEC Community Health Educator, Dr. Elena Navas. Below is a snapshot of our publication themes in 2016-2017! ChicagoCHEC Publication Themes based on Publication Titles and Abstracts. Larger words represent more prevalent publication themes. More on Research Metrics coming soon!